Announcing my return here after a little time away. How time has flown! There’s been a lot of knitting. A summer cotton top in Paintbox yarn from Loveknitting.com is almost finished, sadly it was not in time for the summer here in the UK but it will be good for next year. Anyone remember Pacers minty chews in the 80’s? The top is that Pacers spearmint green with white stripes – picture to follow soon. I have a half finished blanket, in DROPS Nepal yarn – love this yarn – so soft – it knits fairly quickly – picture to follow soon too. You can’t get DROPS in the UK too often. I picked up enough to finish the blanket at The Knitting and Stitching Show at Alexandra Palace recently. Otherwise this could have definitely become an UFO as I was playing chicken with the yarn I had! I have revisited a pink cardigan that has sat in a bag almost finished for about a year – still a little more to go on that WIP – it WILL be worn this autumn, I have promised myself. THIS project … previously blogged baby cardi in progress … I had hoped to show and crow about it again BUT the finished item has been designated to a charity shop – I hated it when it was done! The colours looked wrong together and the sewing up wasn’t as neat as I wanted it to be. Completed at a stressful time, I don’t think Id knitted much love into it. Has anyone read Love in Every Stitch by Lee Gant? I just read a review about the book – wondering if it’s a good read. I often think a little bit of love goes into every item I make. Sewing over the summer: I finished table mats. Not a lot I know! Mind you, I was involved in a charity sale in September and those table mats sold so it was worth it. 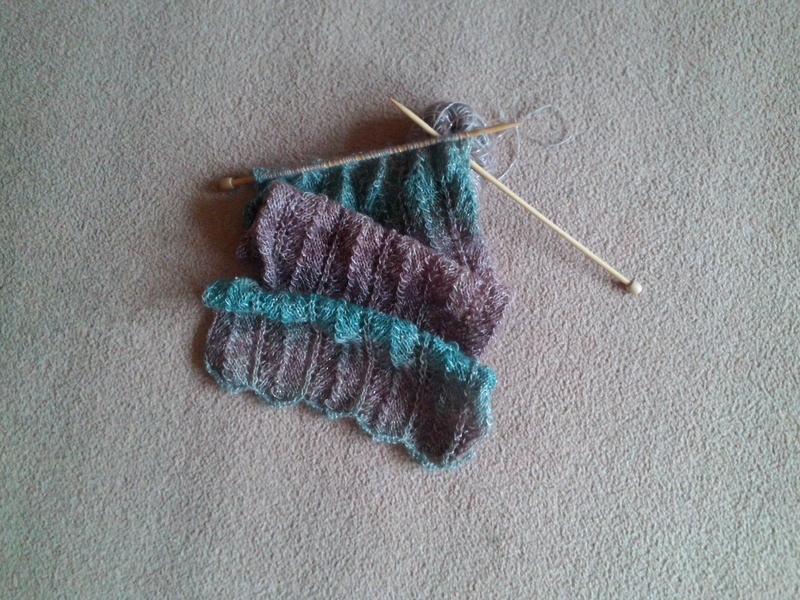 Oh, and last week I finished a joint knitty/sewy project – watch this space later in the week for a photo of that too. At the top of this post is a photo of a little freehand embroidery project from a while ago – just showing it off really. It sits above my desk in my craft room. Having just purchased a further selection of hoops I have several more ‘hoop’ projects in my head – including a Christmas one or two . Back to blogging regularly. Please keep popping by ! This entry was posted in Uncategorized and tagged Alexandra Palace, DROPS, embroidery, knit, Knitting and Stitching Show, Lee Gant, Love in Every Stitch, loveknitting, Paintbox, sew.